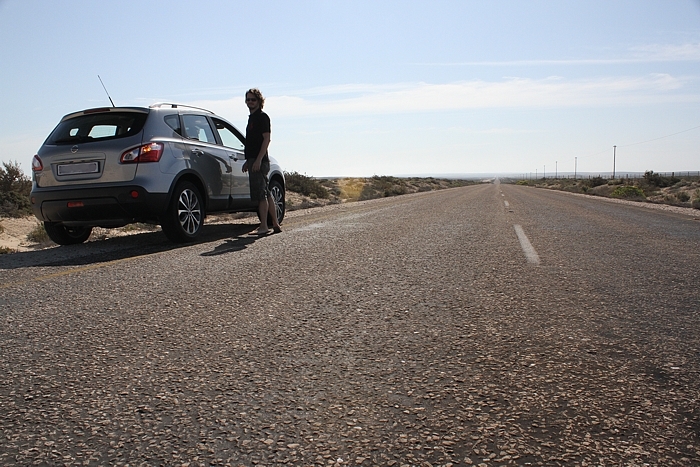 This is one of those long stretches of road in the Northern Cape that seemingly go on forever in a straight line (Fig. 1). There is a real sense of desolation, with the cold Atlantic on the left hand side and the dry Richtersveld on the right, in what is one of the least populated landscapes in the Cape. The sense of solitude starts kicking in as soon as Steinkopf is left behind. Once across Anenous Pass with its exhilarating views, the landscape quickly becomes flat and languid. The mountains are left behind, and the desert sand is left, right and centre, more and more so as one drives towards the north, towards river Orange. Fig. 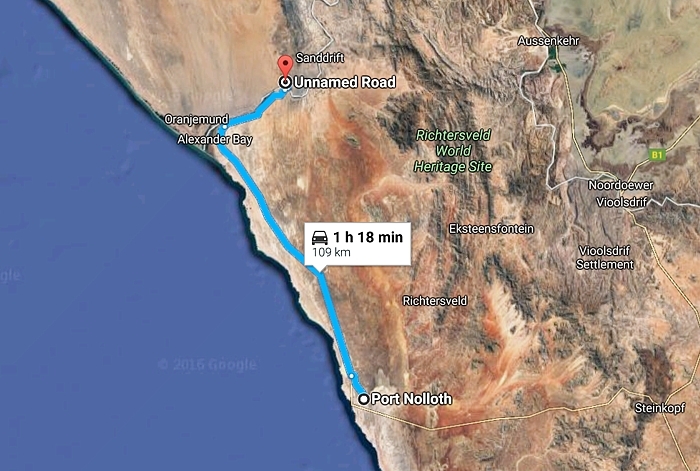 1: The straight, very well maintained coastal road links the diamond mining region at the mouth of river Orange, with Namaqualand. Almost any car will do for this trip, although a high-clearance vehicle, preferably a 4×4, quickly becomes a necessity as soon as tarred roads are left behind. With Andrej (in the picture) we’ve learned this the hard way. Port Nolloth is a quiet fishing town catering to only a handful of visitors during wintertime, mostly nature lovers. Few venture this far, almost exactly 700 km north of Cape Town. Just outside the town, the land is still relatively green with up to a meter tall shrubs and small succulent plants and bulbs hiding beneath them in the desert sand. There is just 85 km to cover on the way to Alexander Bay, but something tells me that this is not going to be an hour’s trip. Fig. 2: P. adriaanii is one of the bigger Otidia species. Found elsewhere, P. paniculatum and P. crithmifolium can grow to this size as well though. 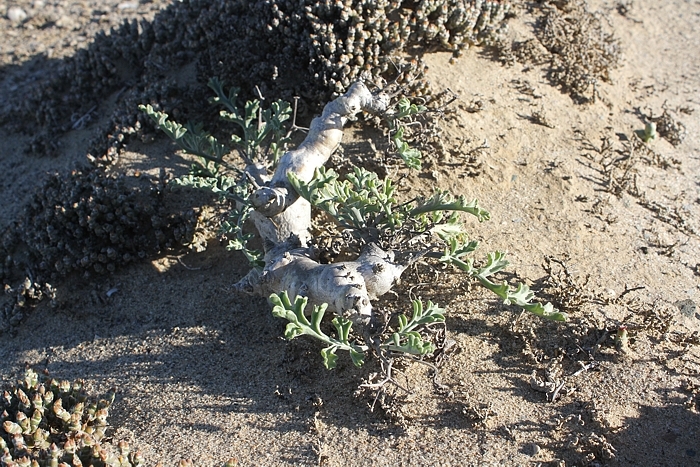 The first surprise meets us very soon after we’ve left Port Nolloth: P. adriaanii, described only in 2005, forms large shrubs, unlike any other Otidia species (Fig. 2). They are not numerous, and usually form small populations, but are certainly conspicuous, with many seedlings demonstrating that this is a healthy population. The plants are up to 70 cm tall and still taller when in flower, with numerous dry inflorescence remains. The flowers have white to pinkish petals, short hypanthia and long pedicels, which gives the pseudo-umbels an unusually open appearance. The plants are covered in lichen indicating decades of peaceful existence. There are a few spots where P. adriaanii are slightly more numerous, though no further than about 40 km north of Port Nolloth. The last population of these plants is already a bit unusual in that it does not appear to have fertile stamens, indicating hybridisation (Fig. 3). The pedicels of this population, visited already in 2003, are also a bit shorter, as if this was a cross with P. parviflorum, which become more numerous further north. Fig. 3: As we drive further north, one of the last populations of P. adriaanii we see has mostly infertile stamens, which might indicate hybrid origin. 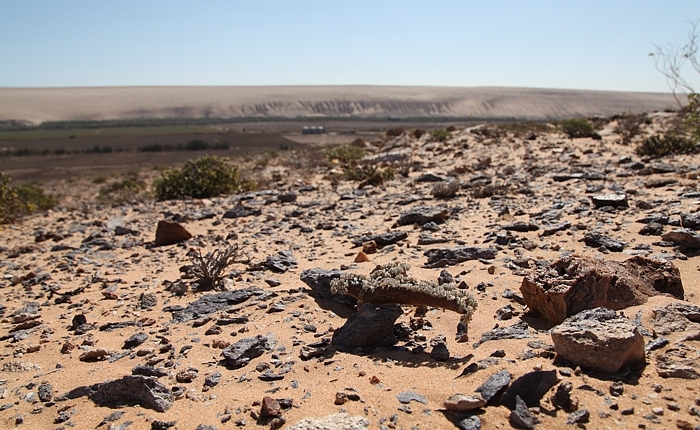 Once P. adriaanii disappear, the landscape starts becoming less and less green as well. The average annual rainfall decreases until it reaches about 50 mm at the mouth of river Orange. A smaller otidia now becomes prevalent, P. parviflorum typically only grows up to 15 cm tall, often half buried in the sand with disproportionately thick stems of up to 3 cm diameter (Fig. 4). Its leaves are less numerous, mostly arranged at tips of branches. These plants look knobbly and incredibly old. They are quite numerous though, with lots of seedlings ensuring continued survival. True to their name, the petals of these plants are short, in fact usually much shorter then sepals. Well-watered greenhouse plants may well develop longer petals (and certainly much thinner branches), which contributes to the confusion of this species with P. carnosum, which is found much further south. The petals also have no markings and are mostly yellow-green. These populations have no tubers and could be classified as “ssp. parviflorum”, although the subspecies have not been formally published yet. Cultivated P. parviflorum are quite floriferous, and with the rather compact inflorescences can be quite tidy and showy. The hypanthia and pedicels are short though long enough in order for pseudo-umbels not to appear compact to the point where they become masses of petals and sepals – a characteristic of P. polycephalum, growing about 100 km inland from here, in the mountains. Fig. 4: Adult P. parviflorum plants have an incredibly prehistoric allure, sadly, this is all but lost in cultivation unless ample sunlight can be provided year-round. P. parviflorum are found in the good company of succulent euphorbias, bulbous babianas, and many other succulents. Among these, low-growing Sarcocaulon patersonii put their large pink to purple flowers on show in the midst of winter (Fig. 5). Also members of the geranium family, the habit of these plants – with their thick horizontal branches – is very different from the plants we encounter just a few kilometres inland along the river. There, Sarcocaulon patersonii develop into large, upright bushes with much thinner branches. The horizontal growth of plants closer to the coast must be the consequence of frequent strong winds. 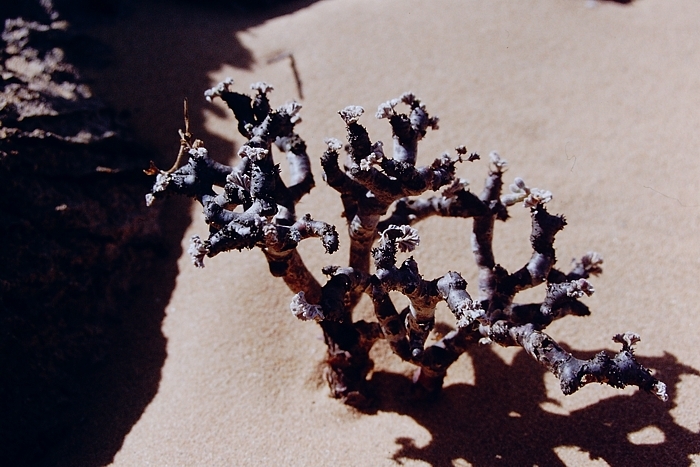 This is reminiscent of many plants on the Lüderitz peninsula in southern Namibia: there, Sarcocaulon patersonii are entirely horizontal, with the branches polished to perfection by wind and sand, with spines only at the tips of branches. It is incredible to think that these and the lush shrubs encountered inland from Alexander Bay are the same species. Fig. 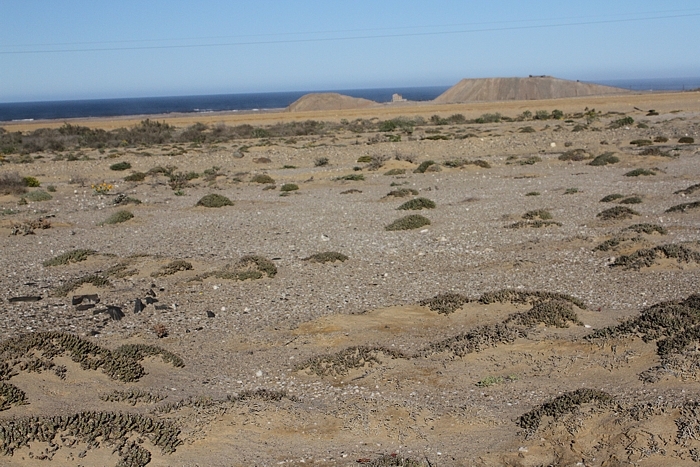 5: Close to the coastline, Sarcocaulon patersonii shrubs remain small and almost horizontal as a consequence of frequent strong winds. As we approach Alexander Bay, large mountains of mining waste rise above the horizon between the road and the Atlantic. These are the first signs of diamond mining activity (Fig. 6), which defines this area and the small town where river Orange meets the Atlantic. Most of the coastline is off-limits, which is really quite alright, because we haven’t travelled this far to have a dip in the freezing ocean. Fig. 6: The mounds of diamond mining waste indicate that we have come very close to Alexander Bay. The small mounds of sand hide roadside litter and many interesting plants. Alexander Bay is a handy stop to fill the tank and stock up on braai wood and wine, before we turn east to explore the landscape a few kilometres further inland. The river is hidden in a reassuringly green belt, quickly transitioning into a sea of dryness. By now, the landscape has turned into sand with scattered rocky outcrops, acting as barriers to early morning fogs. These are frequent and bring in the much-needed moisture, which many animals and plants have learned to absorb. Not much compared to a good summer shower in a temperate climate, and yet if you look closer to the ground, particularly in rock crevices, the landscape is anything but a desert, it is in fact abound with conophytums, tylecodons, othonnas, mesembs, as well as stapeliads, among which Stapelia gariepensis is the most showy, even if it smells foul (Fig. 7). Fig. 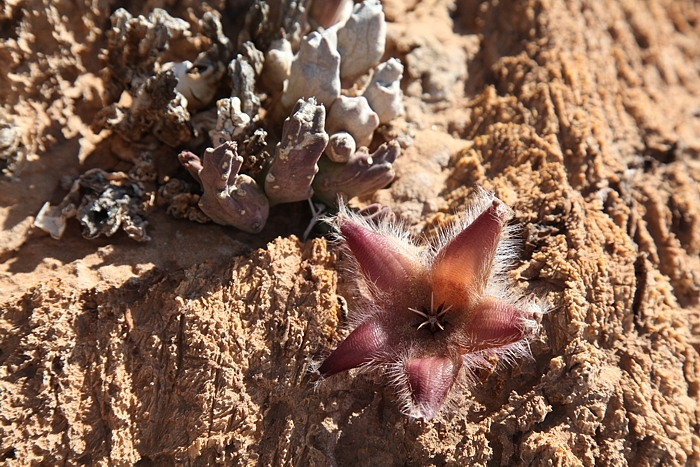 7: Close to the river mouth, Stapelia gariepensis is quite numerous, although it requires rocky outcrops to cling on. The grey finger-sized stems produce an incredible flower show in the winter, beautiful to look at, though rather less attractive to smell. While there are succulents in every nook and cranny, big bushes seek the shelter of rocks: Pelargonium kinghardtense are particularly frequent (Fig. 8). These are very recognisable when leafed up, with the large and thick yellow-green stems, shrubby habit and numerous dry remains of peduncles. These cannot be easily mistaken for other otidias, even when not in leaf. When in flower, however, they are extraordinary – with the pure white petals and numerous flowers, they are quite attractive. Greenhouse grown plants rarely assume these shapes, and mostly develop a few vertical and thin branches, although still quite recognisable due to the succulent cuneate leaves, unique for the section. Fig. 8: Pelargonium kinghardtense start as small, almost round golf ball-sized plants often germinating in rock crevices, but develop into massive shrubs with age. Along with the large otidias grow two smaller Cortusina species. When young, they might even be mistaken for one another, due to the hairy leaves and small but numerous tubers. However, P. crassicaule develops into respectable shrubs with repeatedly branched dark brown stems of <1 cm diameter (Fig. 9). 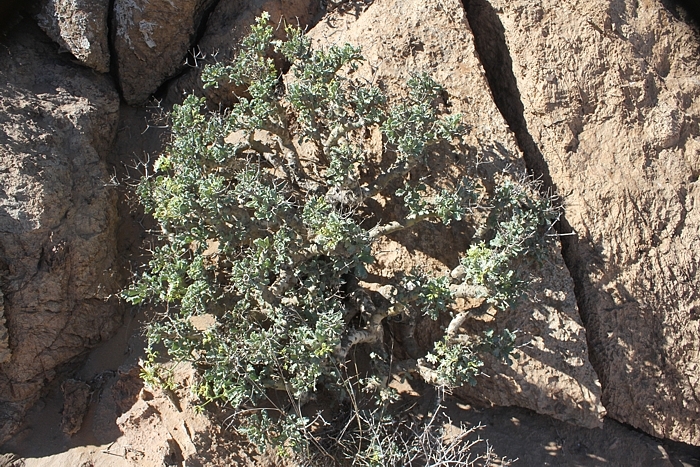 Not unlike Sarcocaulon patersonii discussed above, one could compare these shrubs with the much smaller plants on the Lüderitz peninsula, which typically have stems up to 3 cm thick. Some even consider these populations as different species, with the thin-stemmed ones being called P. mirabile Dinter or P. mirandus Clifton (a recent name replacing the earlier, non-legitimate mirabile epithet), although these are quite likely just ecotypes. In greenhouse culture, it certainly isn’t possible to tell them apart. Fig. 9: Some consider P. crassicaule and P. mirandus to be two distinct species, if grown in a greenhouse it becomes clearer that they represent ecotypes. Kneeling further down, three more species reveal themselves. 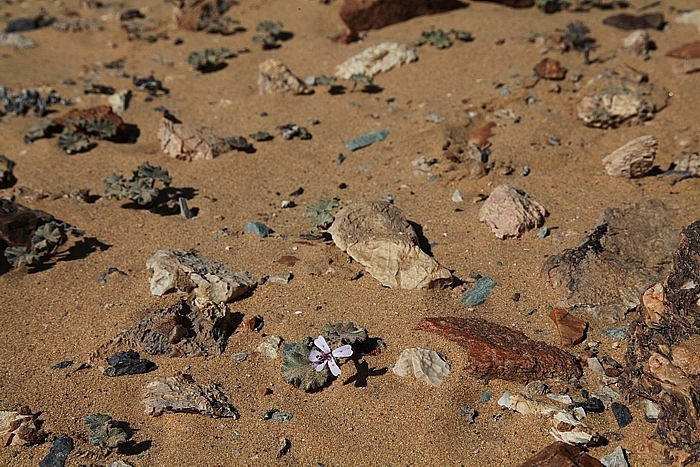 With its extensive system of underground tubers, small rosettes, and disproportionately showy flowers, P. sibthorpiifolium is a cortusina that is always a surprise to find, although it must be widely distributed between Alexander Bay and Lüderitz, possibly even much further north (Fig. 10). However, coastal Sperrgebiet remains very difficult to access and undoubtedly hides more surprises. Fig. 10: P. sibthorpiifolium is an easily recognisable species and always a surprise to find. 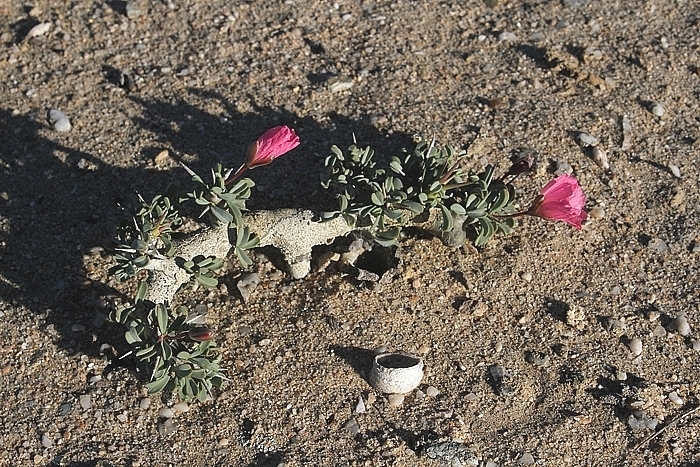 Particularly beautiful in early winter when in flower, some populations in southern Namibia have leaves with an almost pleated appearance, while the leaves of plants closer to Alexander Bay are flatter. Found in consolidated dunes, P. sibthorpiifolium is not difficult to grow in a greenhouse, except that it needs a lot of sun to flower and is probably best watered from below. Although this is a dry environment, there is moisture deep in the sand, and morning fogs or overnight condensation keeps the plants moist. Particularly in winter, the difference between day and night temperatures can easily amount to 20 ˚C, meaning that water condenses on plants during the night and hairy leaves enable moisture to accumulate. During summertime, P. sibthorpiifolium disappear underground completely, and show no signs of life. An otidia that adopted a similarly cryptic habit is P. albersii. This miniature also has substantial underground tubers and tiny stems, usually thinner than 1 cm. Normally no taller than 5 cm, larger plants can be encountered with stems up to 15 cm tall. 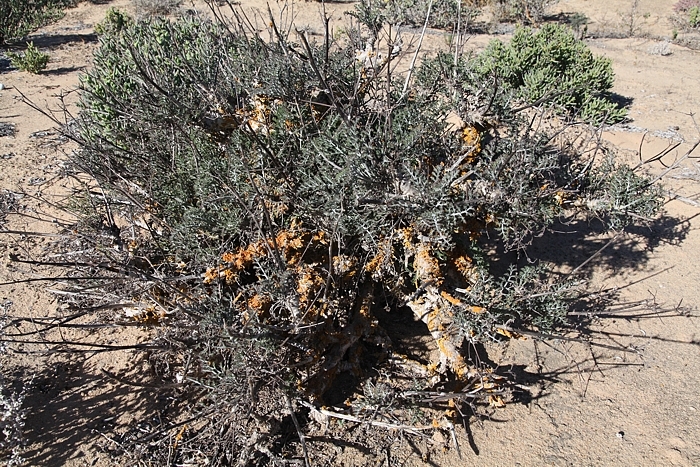 In the recent publication of this species, which was separated from P. ceratophyllum only in 2008, it is theorised that the separation of the two species occurred because P. albersii occupies sandy habitats and often becomes buried. Therefore, much of the plant is below ground, unlike P. ceratophyllum, which does not have tubers. Apart from petal colour, there is another distinguishing character: the flowers of P. albersii are lemon-scented while those of P. ceratophyllum are apparently not scented at all. There are no habitats reported where this could be simultaneously experienced in nature though! In this treasure-trove of pelargoniums, another surprise awaits. The tiny Sarcocaulon multifidum plants are truly quite unique in the genus (Fig. 11). With their hairy pinnate leaves they are well-equipped to sample moisture from the air and although they often develop branches thicker than 1 cm, most of their bodies is actually underground. The numerous thickened roots represent a suitable water supply for the hotter months. Fig. 11: The tiniest of them all, Sarcocaulon multifidum rarely grows taller than 5 cm but still puts on quite a show with its large flowers (for a flowering plant see the P. sibthorpiifolium page). The green ribbon in the back is river Orange, and beyond, the vastness of southern Namibian deserts. Fig. 12: Most of the roads on this stretch are easily accessible and tarred, with the exception of the last bit of perhaps 10 km along river Orange. The gravel road here is in a good condition though. The easily navigable but extraordinarily exciting trip from Port Nolloth to Alexander Bay (Fig. 12) has thus come to an end. In the short distance of a little more than 100 km, we’ve seen the succulent pelargoniums transition from large shrubs to predominantly underground plants. By now, the day is firmly leaning into early evening, and the night falls soon during a southern August. It’ll soon be time to start the evening braai and open that bottle of delicious Cape wine. 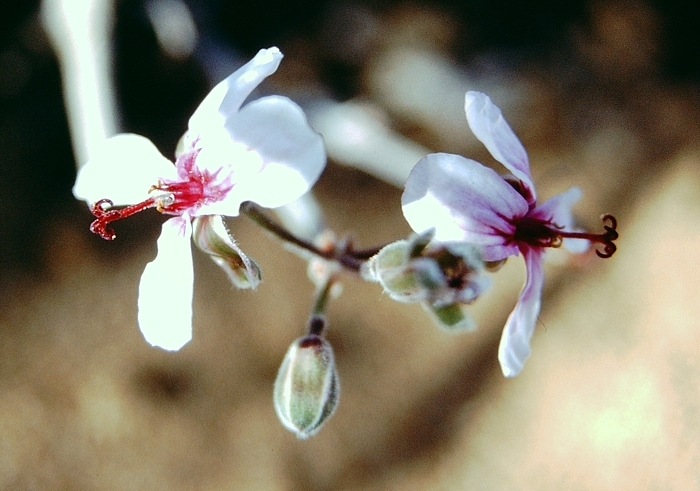 Cite as: M. Strlič: Shrubby Pelargoniums of Coastal Richtersveld, Pelargonium Notes, #3 (2016).